One of the companies presenting at last week's Mashup Event was Secret London. Secret London have got a great story. Starting as a Facebook group in January they now have over 200,000 members. A couple of weeks ago some volunteers recruited through Facebook built this site, for users to share their London tips (blog post on how they built the site here). So far it's pretty good, if a little free for all (I know, that's the point), and with no search. 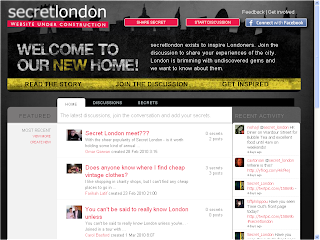 It's also bound to get confused with this site which is the top search result for 'Secret London'. So far Secret London looks very much like LondonByLondon, from a few years ago. They clearly have strong ambitions - look at all of the other cities that are in the pipeline. Let's see how it develops.